Gillette FINALLY makes a razor that gamers can use! 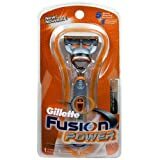 Hilarious Amazon.com user reviews of Gillette's new gamer targeted razor, the "Gillette Razor Power Fusion Gamer." Might be planned parody, but funny none the less. Who's behind this? Seems too well done to be random. Gillette takes the lead in razor tech with this next generation razor. "Gillette Fusion Power Razor is the first razor to bring advanced electronics to wet shaving and the first shaving system for gamers that combines revolutionary blade technologies on the front and on the back of a single shaving cartridge to deliver the best shave." Today is the official launch of the Fusion by Gillette. It is a 5 bladed razor and the latest tech and 1st of the 5 blade dispoables. Pick one up at your local store like Wal-Mart or Walgreens today. Don't cut your skin.